One facet of life I enjoy the most is seeing young people that I hired in past decades work their way into leadership positions around the country. Such is the case with Eric Hammerling, Director of the Connecticut Forest and Park Association, or CFPA, since 2008. I first met Eric during the years I worked intensively with Congressman Silvio Conte, then ranking Republican on the House Appropriations Committee. When Silvio passed away in 1991, I hired Eric to work at the National Fish and Wildlife Foundation, or NFWF, where he in short order met a young lady on my staff, got married, and moved to California for graduate school. 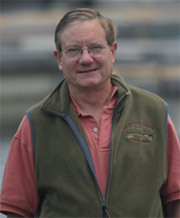 In 1997, Eric returned to NFWF, where he became the first Director of our California field office. In 2002, Eric left NFWF to move to Connecticut and direct the Farmington River Watershed Association. Eric chuckled and told me that while interviewing for the job, he “just knew it was meant to be” when he saw the name “Amos Eno” on a plaque at the Simsbury Free Library Building. That was my great-grandfather Amos, a Simsbury native and philanthropist who helped found the library in 1874. Their Blue-Blazed trail system anchors that connection. Running through more than 800 miles of forests, fields, and wetlands in 88 Connecticut towns, the majority of these trails are on private land. Public use and protection of these rights has been provided over the decades primarily through the goodwill of landowners, often with little more than a handshake. In recent years, CFPA has sought to make private land protections more permanent - through easements and acquisition - and to ensure that state agencies meet their stewardship obligations for managing the forestlands under their jurisdiction. And therein lies the rub. The threats that CFPA faces today - in maintaining private land protections and public land stewardship - represent a microcosm of the budget and conservation battles that lie ahead for much of the United States. The 2008 implosion of the nationwide mortgage market and corresponding decreases in tax rolls have only served to exacerbate the situation. Connecticut’s wealthiest county, Fairfield, known for its banking industry, historically pays one-half of the state’s tax base and has been hard-hit in the downturn. In short, Eric says, “Connecticut’s budget is in shambles.” Cuts have been severe across the board. The economy has made the financial situation of all land trusts, including CFPA, more precarious while simultaneously threatening to roll back a significant number of protections for private lands. The urgency of ensuring a protected corridor of private land along the Blue-Blazed trails, particularly the newly designated New England National Scenic Trail, is growing. Without going into the arcane details, suffice to say that the looming expiration of tax protections established 100 years ago for private landowners is due to expire by 2013. This would put an onerous tax burden on Connecticut property holders who have kept their land in working forest or agriculture all those years. This reminds me of the American Jobs and Closing Tax Loopholes Act, which if passed by the Senate will extend tax deductions for conservation contributions of real property - but only for one more year. CFPA is trying to work out a compromise that will allow landowners to switch, penalty-free, into a program that taxes agricultural land at “use value” rather than market rates. As in Connecticut, the future of private land conservation nationwide is uncertain, and increasingly, will be decided at the state level. I hope there will be enough Erics from the up and coming generations to help us protect and sustain America’s rich natural heritage.